What Type of Sausage Do You Need? These are the basic categories (not flavors) of sausages. Fresh Sausage: made from meats that are neither cured nor smoked. They must be cooked before serving. Cooked Sausage: made from uncured meats that are cooked but not smoked. Cooked, Smoked Sausage: made from cured meats that are lightly smoked, then cooked. They do not require further cooking. These include bologna and hot dogs. Uncooked, Smoked Sausage: either cooked or cured meats that are smoked and then later cooked before serving. 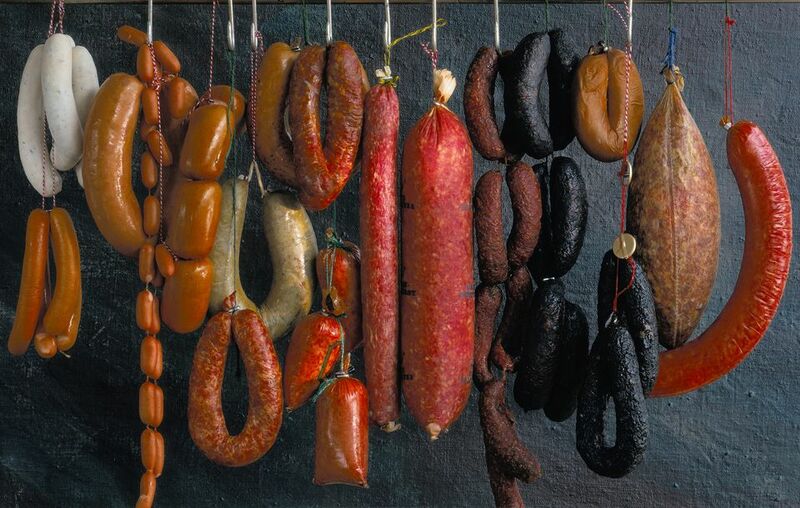 Dry Sausage: also called summer sausage (because it can be kept in warm weather without refrigeration) and seminary sausage (because it is associated with the type of sausages made at monasteries), made from cured sausage that is air-dried under controlled time temperature-humidity conditions. They may or may not be smoked. Lebanon bologna, salami, kosher sausage, and Spanish chorizo are examples of such sausages. Specialty Meats: a wide range of products made from cured or non-cured chopped or comminuted meats, usually baked or cooked rather than smoked and formed into loaves to be sliced and served cold in salads or sandwiches or as a breakfast meat, like scrapple. • What is Sausage and What is it Made From? How Do You Use Each Variety of Shortening in Baking?